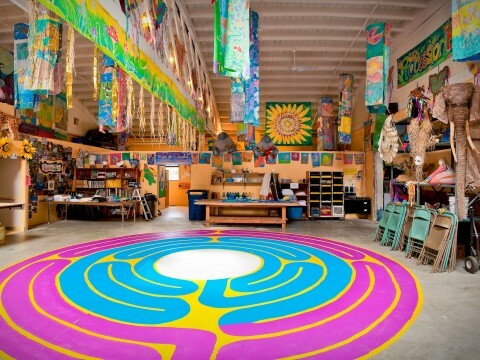 The Procession Community Art Studio and Event Space is a delightfully decorated with beautiful Procession artwork and batiks. It is the perfect venue for conferences, get-togethers, retreats, seminars, and children’s or adult parties. We even offer art workshop parties where you and your guests can create and play! We have competitive pricing and offer some discounts for non-profits. Please give us a call if you would like to take a tour of the facility and have more information about reserving this eclectic space. Contact us to schedule an appointment to view this eclectic space at 360-705-1087. Yes the The Procession Community Art Studio is again ready for the public. This is your chance to be part of a grass roots effort to make this happen in our town.. We are hoping to raise funds to continue to keep the studio open year round and still be able to house the 7 week Procession studio. We have daily, weekly, and monthly rates for artists work space. As part of your committment, you will be asked to participate in some maintenace and upkeep of the studio. If you'd like to take a look at the possibilities please contact us at 705-1087 to schedule an appointment to visit the space, and discuss pricing. We also have a stunningly beautiful event space available for conferences, get-togethers, seminars, and children’s or adult parties. We also offer art workshop parties. We will accommodate your every need. We have competitive pricing and offer some discounts for non-profits. Contact us to schedule an appointment to view this eclectic space at 705-1087.